Just when you thought Ducati’s super-exclusive MH900E was impossible to get hold of… a British dealer has managed to bag a couple. But if you want one you really shouldn’t hang about. DK has just two of the rare beauties. 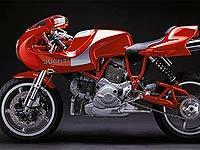 The bike was originally only sold on a first-come-first-served basis through Ducati’s own website, and in strictly limited numbers. Registered users of this site will have had a head start with an advance warning e-mail. If you haven’t registered yet, click on Log In at the top, right of the page and follow the on screen instructions. It only takes a moment. Other hot DK deals you’ll currently find on this site are the GSX-R1000 for £7995, GSX-R600 for £5999, R1 for £6999, SP-1 for £7499 and an RSV Mille for £7499. All bikes are year 2001 models. You’ll find all those deals by clicking on Bikemart at the top of this page and then following the DK link.